Yoda is one of my favourite characters – it seems that others agree. In a galaxy not so far from you, Portland USA you can do experience the force. 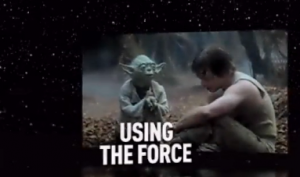 Star Wars yoga is a class for men only with each pose appropriately (?) renamed. In class we are often dealing with energy, and when teaching Uujayi breath, like the instructor in the video, I have likened it to Darth Veda breathing. Of course it doesn’t need to be so strong, but gives a clear mental picture fo how it should sound – along withe the sound of the sea in a shell and soft snoring. Watch this fun video here. It is bound to increase your happiness quotient!